Our Company provides national road transportation and international road transportation within the EU using our own database of contract carriers. With results of our work we are trying to improve the lives of people we work with. Our company is built on three core pillars: Solvency, Honesty, Prosperity. 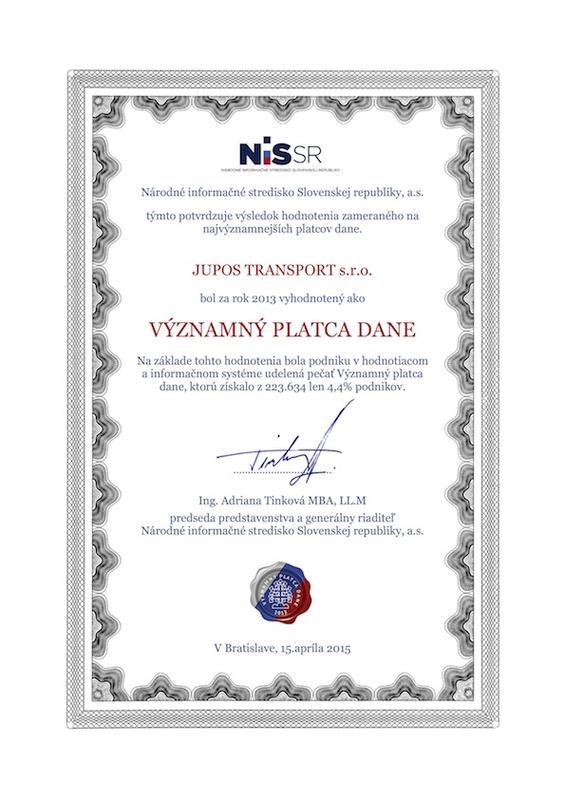 Since 2002 we have been helping our customers with transportation. Our activity is focused on road transportation supported by external carriers in the whole of Europe. Lenka Chalupková is voluntarily leaving the “board of the JUPOS Transport ship”. Our turnover in 2015 has increased by almost 45% in comparison with 2014. Ľudmila Adamkovičová successfully finished the seminar – Effective leading of business conversation. Popular services are mostly national transport and oversize loading transport services which require economical and urgent approach, when, in most cases we can use our own database of contract carriers. We are a team made to help to ensure the road transportation. Our main focus lies in serving our customers so that their problems in transportation will be solved and so they can get what they need. We take care of our customers on a 24-hour–basis, 7 days a week to ensure that they don’t have any problems with transportation and are not in danger. When providing the services, we take responsibility for our customers´ success and troubles. We are aware that our service is finished only when both sides get what they agreed on. We get a regular training in the area of handling of work so we can easily handle all the barriers that could stand in our way to help. Our Company provides national and international road transportation within the EU using our own database of contract carriers. Thanks to our system, we are able to provide any type of transportation from 1kg to 200t and we can offer you the most (cost-) efficient solution for your transportation problem. The whole loading capacity of the required vehicle is available to the Customer. Customers can lower their costs of transporting goods by ordering specific loading capacity of the required vehicle. Thanks to our own database of contract carriers, we are able to offer our customers a wide range of vehicles to import and export within Europe. These are the heart of our company and we treat them very responsibly with particular attention paid to the quality of provided services. We treat each order individually - regarding the customer’s requirements and we are able to respond immediately to the customer’s order. Once the offer has been introduced, WE GUARANTEE THE PRICE OF THE TRANSPORT as long as the agreed terms are not violated by the customer. Thanks to our own database of contract carriers, we are able to check the current location of the vehicles, which ensures that we have fast loading of the goods and express delivery within 24h. In these types of transportation, we can ensure the transport regarding the specific customer’s requirements – specific time of loading and unloading. This involves mostly the transportation of industrial goods within Slovakia, where we can deliver the goods on the day of loading for shared vehicle transport prices. We cooperate with transportation companies in other countries, which are specialized for oversized loads transportation, so we can ensure various types of transportation regarding the required specifications. Since 2002 we have been helping our customers with transportation. Our company is built on three core pillars: Solvency, Honesty and Prosperity. Without any compromises. Thanks to this solid basis, we are able to contribute to a better and healthier transportation scene and to influence it. Our activity is focused on road transportation supported by external carriers in the whole of Europe. We have our own database of about 2,500 irregular contacts on carriers. We are focused mainly on manufacturing companies to which we are available on a 24-hour-basis. We treat every demand individually with regards on customer´s requirements. To establish an expanding company on the transportation market, which will be an example of ethical working, production and extraordinary relationships with our partners that will make the handling of transportation activities for our customers easier. To help our customers with their transportation demands. The result of our work is the improvement of the lives of people we work with. TO BE A GOOD EXAMPLE for other companies, regarding the success, ethics and system of our work. To ensure the satisfaction, high income for a great production and long-lasting professional and human growth of all employees. To take care of and provide work for carrier, so they can prosper. To establish an expanding company on the transportation market, which will be an example of ethical working, production and extraordinary human relationships. We search for the best solutions for our customers, which will satisfy them and will not burden their budget. To provide the best services we can for our customers. We keep searching and contacting new customers in the logistics and transportation area. Our Management is based on the administration and ethics technology. To provide our carriers enough of a good, appropriately valued and in time paid work, which can help them with developing and modernizing their vehicle fleet and secure the duration of their companies. We turn our thoughts into acts and that brings results. - Cesta ku šťastiu, o.z. - Slovensko bez drog, o.z. Our team has increased by a new jupos teammate Miriam Maruniaková. Juraj Poništ successfully finished the seminar – How to apply successful methods and keep them alive. Ľubomír Kodai successfully finished the training – Keys to boss´ communication. Our team has increased by a new jupos teammate Ľudmila Adamkovičová.